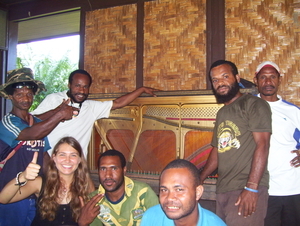 Meeting in Papua-Newguinea © Mission Eine Welt e.V. Welcome to the homepage of the International Youth Voluteer Service (German Abbreviation: IJFD). This Website includes information for the foreign partners as well as the places of assignment of the German deployment organisations (=placement agencies). It is a summary of the German websites. The IJFD is a voluntary programme run by the Federal Ministry for Family, Senior Citizens, Women and Youth. It was established on January 1st 2011. The programme enables young people living in Germany to do a voluntary service abroad. Within the scope of this service, the young volunteers can gather intercultural, socio-political and personal expierence in a different cultural environment. The IJFD is meant to serve humanity, and also brings a wealth of expierence to the volunteer's personality. The German government grants financial support to the placement agencies of the IJFD, so that as many young people as possible can make use of this opportunity to enhance their knowledge. The IJFD is based on a guideline issued by the German Federal Government. You may download here the Guideline for the Implementation of the International Youth Volunteer Service in English language. Who can volunteer in the IJFD? Young People residing in Germany can volunteer in the IJFD. Starting their volunteer service abroad they must have completed their school education and at the end of their service they must not have reached the age of 27 yet. Thus, also young people under 18 years of age may serve in the IJFD. But the final decision whether minors will be sent abroad or not is reached by the responsible placement agency. do not serve in their home country. Young people not living in Germany cannot volunteer in the IJFD. If they want to do a voluntary service in Germany, they can get more information in German language here. In which countries can people do the IJFD? Volunteers can serve in any country of the world as long as the German Federal Foreign Office has neither issued a travel warning for the country concerned nor raised any other concerns over safety. In which areas can an IJFD be rendered? in peace and reconciliation work as well as in the promotion of democracy (in this process, any support for political parties is prohibited). The volunteers render a full time service. They neither get any remuneration for their work nor do they negatively effect the labour market in the host country, since their work is only an ancillary activity. The accreditation of a foreign institution as a place of assignment within the scope of the IJFD has to be applied for by the German placement agency at the Federal Office of Family Affairs and Civil Society Functions (German abbreviation: BAFzA). As part of the accreditation process of a foreign institution as a place of assignment for the IJFD an assessment by the Federal Foreign Office on this foreign institution is requested. The volunteers can only serve at the accredited place of assignment. One or more assignment sites for volunteer service can be found at the place of assignment. Each place of assignment and its sites must have been accredited by the BAFzA before the volunteers travel there. A deployment to any other site than the accredited one is prohibited. How long does the IJFD last and when can it be rendered? Generally the duration of the IJFD is 12 months. The minimum duration has to be 6 months, the maximum is 18 months. The time and the duration of the service is agreed upon with the placement agency. What does a volunteer receive during his/her IJFD? These benefits may vary from placement agency to placement agency. a certificate by the placement agency upon completion of the service abroad (and/or, upon request, also a letter of reference). How can young people find an assignment site in the IJFD? Young people who are interested have to apply to an accredited placement agency. They reach an agreement on the voluntary service with the latter when the selection procedure is concluded. The placement agencies belong to the clerical sector, or are ideologically unaffiliated. Volunteers are not sent directly by the BAFzA. Only if a deployment organisation has been accredited as a placement agency in the IJFD it is entitled to send volunteers abroad within the scope of the IJFD programme. to prove that they have a complete educational concept. When the aforementioned conditions are met, an application for accreditation as a placement agency within the IJFD may be submitted to the BAFzA. If all prerequisites have been met, the BAFzA is entitled to accredit the organisation as a placement agency in the IJFD. How does the German government provide financial support? An accredited placement agency may apply for a federal grant to cover expenses incurred through the deployment and mentoring of volunteers. Currently, this financial support amounts to a maximum of 350 € per month per volunteer. expenditure on preparatory and returnee seminars. A legal claim for financial support does not exist. An adequate financial contribution by the volunteers is admissible. However it is prohibited to make the agreement on the IJFD deployment dependent on donations from the volunteers to the placement agency. What are the tasks of the BAFzA with regard to the IJFD? advice and assistance with any questions and problems the volunteers, prospective volunteers, parents, and prospective placement agencies might have.